From June 10th- June 27th I woke up in a guest room, on a futon, or on an air mattress and smiled. I smiled because I was actually doing it. Taking a chance on myself and following the plan I set to get to my goal of becoming the first African American female professional road cyclist. I had the opportunity to race Tulsa Tough, The Harlem Skyscraper Classic, and the Final three days of The Tour of America's Dairyland. First up, Tulsa Tough! I've been listening to the Hamilton Soundtrack on repeat, I believe Washington summed up my emotions the best. I felt "outgunned, outmanned, outnumbered, and outplanned." Regardless, I was there, I was exactly where I'd asked to be, so I was going to get the job done. The first day was tough, but I did it, despite getting caught up behind a crash, I got back into the race and finished 29th. The rest of the weekend didn't go as well. The second day came with a super high, and a super low. This was the first day of my life that I saw the very front of a pro bike race. Me, Ayesha Rosena Anna McGowan was sitting second wheel. I wasn't clinging to the back, I wasn't getting lapped, I WAS IN THE FREAKING FRONT!!!! Sometimes I can't remember if I'm tired or excited. Bike racing is a bit of both most of the time. Unfortunately, my glory moment was short lived. I overheated, lost everything I ate that day, and ended up in an ambulance cooling off trying to stop everything from spinning. That was the opposite of fun. Despite my stomach issues, I was so amazed that I'd actually seen the front of that race. It was the first time I felt like I belonged. Like I wasn't just trying to be a part of it, but that I WAS a part of it. I was dizzy, and hot, and felt pretty awful, but I was also super excited for that glimpse of my progress. On the third day I was determined to crush. I lined up in the front, and prepared to make Crybaby hill beg for mercy. First time up, my exact thoughts were "well that wasn't so bad". Little did I know that it wasn't the climb I should've been worrying about. About fifteen or twenty minutes into the race, I was moving up before turn four and before I knew it, I was donating my skin to the Tulsa pavement. It just so happened to be right next to my newest pals at the medical tent. The medic asked if I wanted to go on. My adrenaline was PUMPING. I recall saying "if my bike is okay, i'm going back in". He sent me to the pit, and while they checked over my bike, I started to throw up. The official asked, "are you going back in?" I said, yes! Then I threw up again. So I said, "nope, I'm done". And that was that. I felt so deflated. I was confused, and sore, and upset. I found my phone, called Will, and started to cry. There might not be crybabies in bike racing, but I was definitely crying. I'm not ashamed of it either. All I could think was "I was doing so well", but I also knew that I didn't want a repeat of the previous day and it was better that I not over do it. While I was on the phone bawling like a disappointed child, the very kind gentlemen at the Saris Cycleops tent handed me a pair of socks and put this very peculiar "naked baby on a bicycle" necklace around my neck. I probably looked beyond pathetic. I appreciate his efforts to console me. Despite having very little success at Tulsa, I actually learned a lot from the experience. I perfected the race day timeline necessary to get a good spot at staging, and I learned about pantyhose ice packs. Mid summer races are brutally hot, it's little tips like the pantyhose ice pack that keeps you cool and competitive! I also learned that I am strong, and capable, and making progress. So sweeeet! Thank you so much to Katie, Scott, Rascal, and Gracie for welcoming me into their home. Thanks to the city of Tulsa for being so kind. 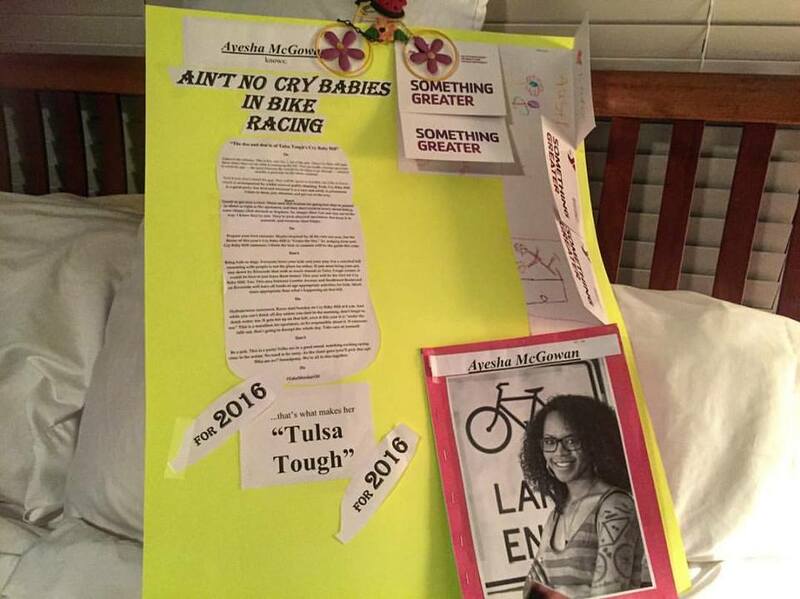 Thank you to the Tulsa Tough organizers for putting on a spectacular series of events. Thank you to the medical tent for taking care of me when I wasn't at my best. Thanks to SRAM NRS for always dealing with my clinks and clanks despite my refusal to use real bike terminology. Thanks to News 6 for this impromptu interview, and to the old lady who asked for my autograph and made me feel like a superstar. Thank you to Hatchmap, Cannondale, and Starlight Custom Apparel for supporting me on this endeavor. And thank you to all of you who bother to read this blog and/or share your support and kind words with me. It really keeps me going, Thank you! This one didn't have such a happy ending, but that's fine. I learned a ton, and didn't break anything. Always look on the bright side of life! Enjoy this gallery of photographs. You've probably already seen many of them if you follow me on the instagrams!